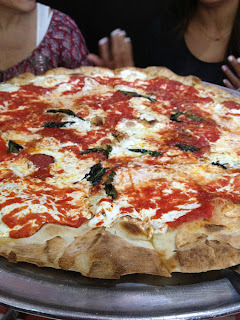 Little Ms. Piggys: A Slice of Brooklyn: Pizza Tour! Over the summer Hubby JL and I were invited to go on a pizza tour run by A Slice of Brooklyn. I hadn't heard about it before, but any mention of a food tour and you can count me in! At 11am on a Sunday, we showed up at the designated meeting spot near Union Square. We didn't have any expectations other than to enjoy a low-key day eating pizza, but by the end of our afternoon with Tony (a true Brooklyn native, the founder, and our tour guide!) we were pleasantly surprised by how much fun we had! Right on time, Tony's very comfortable bus rolled up and all of us pizza-lovers filed on. I'm guessing there was under 20 of us in the group, so (thankfully!) it didn't feel like we were a giant herd of tourists, though tourists did make up a good chunk! First up, a little driving tour of DUMBO and a walk around Brooklyn Bridge Park and Fulton Ferry Landing. The weather was beautiful and the view of Manhattan from the Park was awesome! It's a great place to snap pictures of the Manhattan skyline and the nearby Brooklyn Bridge and Manhattan Bridge. Brooklyn Bridge Park is also home to the newly restored Jane's Carousel. Sitting along the Brooklyn waterfront, it's a great addition to the park with the carousel music playing and the pretty horses prancing about. Keeping in mind our mission of exploring Brooklyn's pizza... nearing noon, we wandered just up the street to Grimaldi's, famous for their Neapolitan-style pizza. You'd think going to Grimaldi's was cool enough, but what was even exponentially more awesome was walking right past the queue of people lined up outside waiting for the open and straight in to the tables reserved for Tony's group. Yes that's right - as a guest of Tony you've got the VIP fastpass! We each got 2 slices of regular pizza and a soft drink included in our tour. 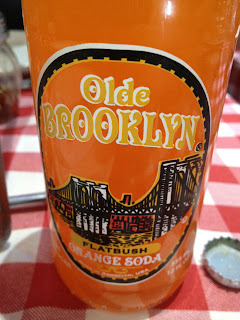 Definitely go for the Olde Brooklyn sodas which come in glass bottles! I've had Grimaldi's pizza before, and while the pizza was as good as always, this trip definitely upped the cool factor up a bit by skipping the line :). The pizza is cooked in a brick oven so the crust has a lovely crunch to it, while the cheese is gooey. So yum! After lunch #1, we hopped back onto the bus and had a driving tour of some neighborhoods in Brooklyn. 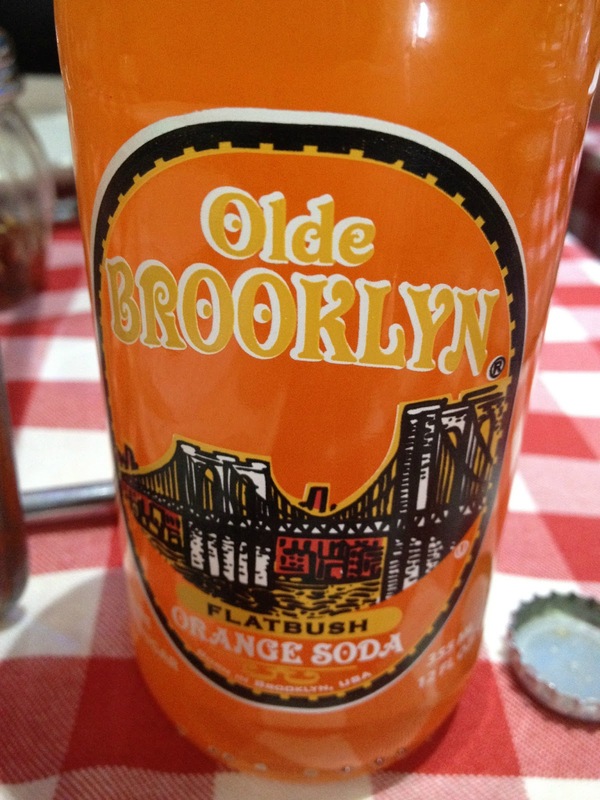 Tony filled us in on some Brooklyn history and also showed us tidbits of films shot around the area. Before we knew it we were at lunch spot #2 - L&B Spumoni Gardens! We tried Neapolitan-style pizza at Grimaldi's and now we were up to try L&B's Sicilian-style pizza to see which one wins us over. At L&B, the cheese is actually underneath the sauce. We each got 2 slices of pizza and soft drinks, but this pizza is so much thicker! I wound up getting so full I took my 2nd slice to go. Before heading back to the city, Tony took us over to Coney Island, just a short drive from L&B. We spent a bit of time on the boardwalk and Tony shared with us some history and the direction Coney Island is moving towards. It had been several years since I've been there and I was shocked to see how much they've built up the amusement rides recently! I'm definitely putting it on my list of day trips for next summer. Before we knew it, 4.5 hours had passed and we were back in the city. Tony took great care of us all. Even though I've been to Brooklyn many times, I had never seen it like this. You also can't beat 'touring' Brooklyn in the comfort of a snazzy air-conditioned bus! (No need to worry about MTA's endless service changes on the weekends). Tony has so much character and you can feel his passion and love for his hometown, you just can't help but love it too! And if you're wondering if Neapolitan or Sicilian pizza won my heart over... I vote Neapolitan! Both were delicious in their own right, but I'm a fan of brick-oven pizza. Can't beat the crust! But I'm curious, what rocks your boat? Piggy says yes (to all three! )!